A warm, gentle breeze stirs the nearby palms. As you lie poolside with a cocktail in hand, the clear skies and relaxed atmosphere evoke images of a desert oasis worlds away. Despite what your eyes may lead you to believe, this is not the Coachella Valley. Nestled in the heart of town, Riviera Mackay merges the oasis-like feel of Palm Springs with the relaxed, tropical vibes of the North Queensland coast. If you are searching for 1 or 2 bedroom holiday apartments that deliver the very best in location, views and interior luxury, your search stops here. A vibrant Palm Springs inspired theme emanates from each room and the panoramic views add to the feeling that you are somewhere completely different. Enormous care has been taken when choosing the furniture to please even the most discerning tastes. With 64 one and two apartments, this 10 level riverfront apartment development is setting a new standard in premium holiday accommodation in Mackay, North QLD. Inspired by Palm Springs, our idea is simple; indulge yourself in the privacy of your own room with the luxury of in-house on call service. ​What else could you ask for? When you choose to stay here, you are spoilt with some many special touches. All rooms include Free Wi-Fi, Samsung Tablet, Foxtel, balcony, L’Occitane amenities and full apartment facilities. All guest rooms and the rooftop terrace at the Riviera Mackay are non-smoking. If you are ready to leave the rat race behind and escape to a place where expansive ocean views and sundrenched palms form the backdrop to every waking hour, Riviera Mackay’s ocean view accommodation delivers the perfect blend of convenience and luxury. 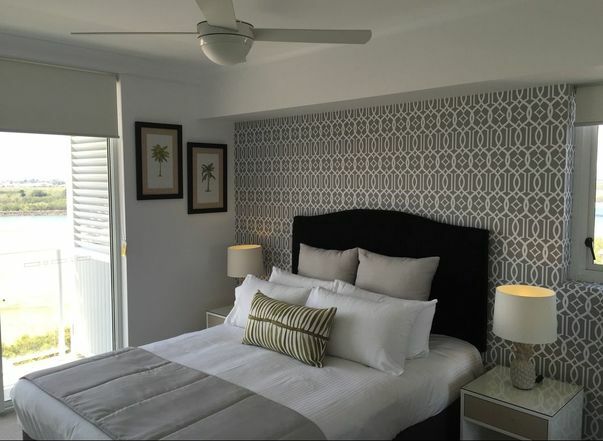 The 1 Bedroom Riviera Apartment provides spacious and comfortable accommodation so you can relax in style. ​With a queen size bed and all the comforts of home, this room is perfect for the solo or couple traveller. Located in the highest of floors, the premium 2 bedroom pioneer apartment offers sweeping views from all windows and the balconies. 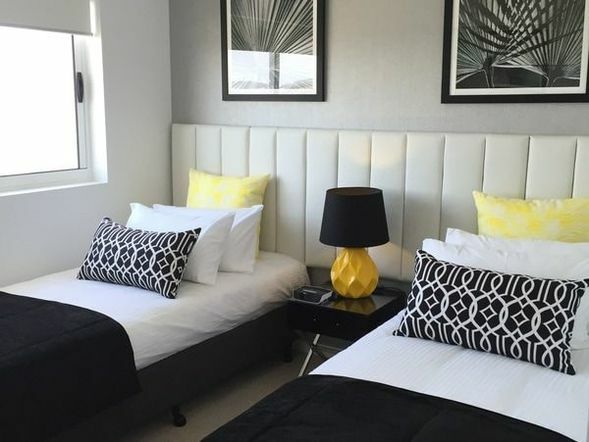 ​This premium room offers that little more for families and friends looking to relax on the balcony and enjoy the best of the North Queensland sunshine.